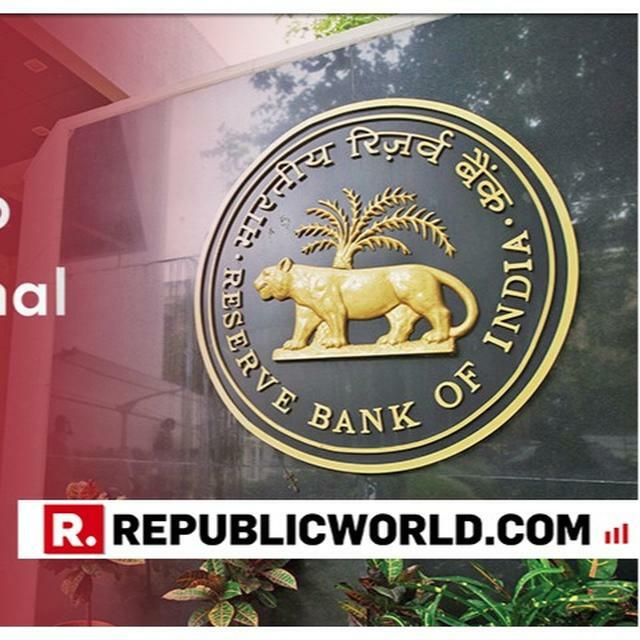 While there have been reports of Congress president Rahul Gandhi putting his foot down to forge an alliance with Arvind Kejriwal-led Aam Aadmi Party in New Delhi, the ruling party in the National Capital has continued its attacks on the Grand Old party in the wake of recent promise to provide minimum guaranteed income to the poorest 20 percent household of the country. 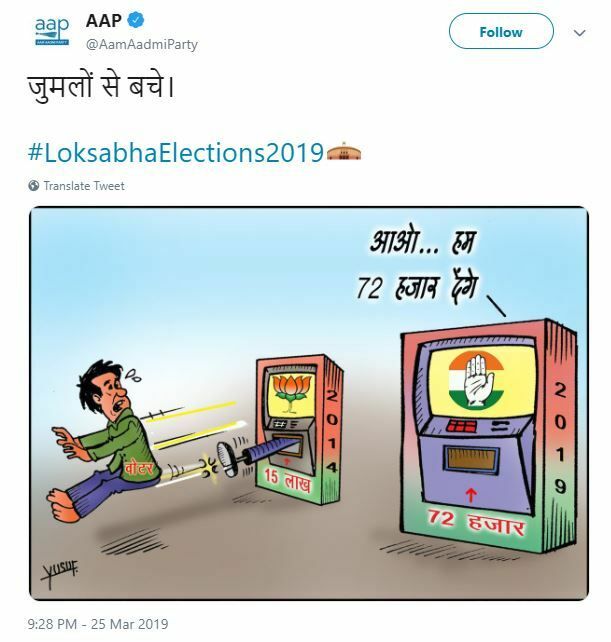 Taking to Twitter on Monday, Aam Aadmi Party posted a cartoon showing two cash vending machine (similar to an ATM) in which one of the machines shows BJP in 2014 and the other machine shows Congress in 2019. On the BJP's side, AAP has shown a man (voter) being kicked out by the vending machine, while on the Congress' side, it is written 'Aao, hum Rs 72,000 denge (Come, we will give you Rs 72,000). The image indicates the Rs 15 lakh promise made by BJP in 2014 Lok Sabha elections to the poor as compared to the recent Rs 72,000 per annum promise made by the Congress president Rahul Gandhi ahead of 2019 elections. The image has been captioned, "Jhumalo se bache| (Keep yourself save from Jhumalas)"
On Monday, Rahul Gandhi announced that Rs 72,000 per year will be given as minimum income to poor families, benefiting around 25 crore people, if his party is voted to power in Lok Sabha polls, while addressing a press conference in New Delhi. 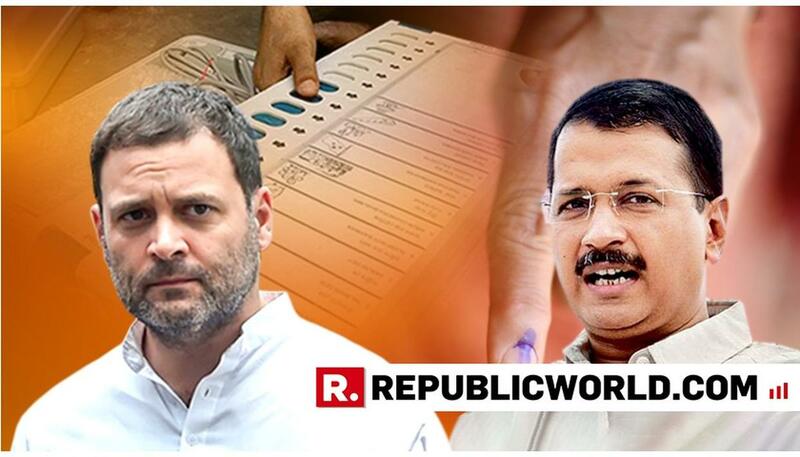 This hidden jibe by the Arvind Kejriwal-led party has come despite the reports of an alliance that Rahul Gandhi is willing to enter into with AAP ahead of Delhi Lok Sabha elections. Although an official announcement is yet awaited from both the leadership, Arvind Kejriwal has been pitching for an alliance in the National Capital over a long time. However, Delhi Congress chief Sheila Dikshit has been quite against the alliance.